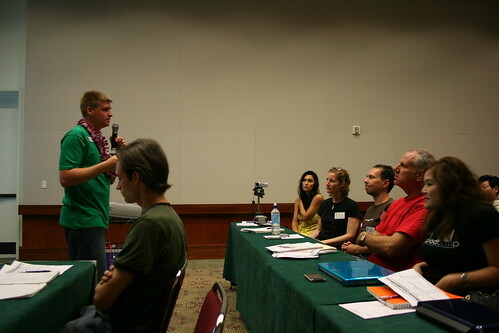 Flying all the way from Pennsylvania for the Social Media Club Workshop, Podcamp and Wordcamp Hawaii, I had no way to know whether or not my session would resonate with the attendees. I was incredibly happy when room 304B was standing room only, and didn't empty once I began my session. I thought, beyond just sharing my slides, I would share the general thoughts that the session covered also. There are a lot of really great examples of good video podcasts, communities, personalities, etc. Although there are some lessons to be learned from all of these examples, the one thing you do not want to do is directly imitate another video podcast. Although their formula works for them, it may not work for you. The best thing to do, when you are trying to learn from others, is to break down what they do into lists of what they do right and what they do wrong. This way as you are going over your general idea for how you're going to use video to build your community - you can learn from their successes and failures without imitating them. There are, in my opinion, a few general points to follow when trying to build an active community (whether you are using video to do it or not). Passion. If you love it, others will too. Consistency. Same time, same place, same channel. Engagement. Get the audience involved. The passion you have for what you are doing will resonate through your video. If you can't find the passion inside of yourself for your product/service/message - go out and find someone who is passionate about it. Ask them to help. Passion is palpable. You can't fake it. Consistency will help build habits. You should be consistent in your release schedule, the feel of your videos, the way you distribute them, etc. This will help your audience to get comfortable with your style and build habits in them that will keep them coming back every single time. Engaging your audience to participate through things like questions, contests, memes, etc. will not only build a strong community base that is active, vocal, and participatory - it will also build more content around your project that you could have never done on your own. There are several ways that you should view video podcasts. Do not think that it is limited to a person being in front of a camera. The best podcasts that I've run across are not a specific person with a mic. Here is a short list of the types of video podcasts that you can produce, depending on your need, and what you think your community would like to see. Traditional video podcasts. Episodic, "short", often. Reviews. Hands on demonstrations, screencasts. Interviews. On location, industry experts. Each of these types of video podcasts (and there are others) can be used depending on your unique community and what you think would work best for them. There are great examples of each of these. Again, the following list of examples are not to be used as a list to mimic. Rather, I would recommend watching a few episodes of each of these examples and try to make a list of the things you like, and you don't like, about each one of them. This is learning from someone else's example and will save you from falling into the same pits as they did. Traditional video podcasts that I'd recommend: Wine Library TV, Beach Walks TV, The Dog Files, Brides Made Fit, Tech Zulu, Digg Nation, Two Guys on Beer. Review based video podcasts: Engadget, The Unofficial Apple Weblog, Playstation blog, Crackberry. Interview based podcasts: Pop17, Moblogic.tv, Rocket Boom. Activity based video podcasts: Ukulele Underground, Scam School. I have learned things from each of these video podcasts. Rather than relay those to you, I think each of you can learn what you need to from each of them to fit your specific project. Again, only spend a few minutes with each of these shows to learn. A few things that you should do, as soon as you can, to get started. Plan your first five shows (optional). I had a ton of fun leading this discussion with all of the attendees in room 304B. I am looking forward to tomorrow's session about WordPress plugins. See you then! Colin Devroe is the Technology Evangelist at Viddler.com. He lives in Pennsylvania with his wife Eliza and his two cats. You can follow him on Twitter and subscribe to his personal site.